Dan Dan Mian (noodles) is a popular Chengdu (Szechuan) street food. Legend has it that around 1841 a hawker named Chin Bau Bau walking the streets selling noodles, carrying two big baskets (front and back) on his shoulder using a bamboo pole called dan in Chinese. With these two baskets, one was the cooker the other was the ingredients and bowls for the noodles. His noodles were so famous the name carries on till today. 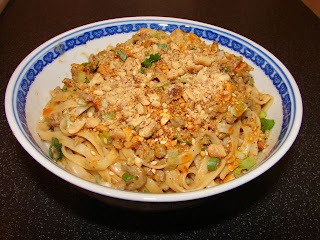 This is a simple stir-in noodles mix with a sauce made with sesame paste, preserved salted vegetable, a little pork (some recipes do not use pork). You can make everything in advance and mix together. Nice serves cold/warm too. 80 g dry Szechuan plain noodles if you can get some, if not any Chinese noodles will do. 1 tbsp Chinese salted preserved vegetable, chopped. Traditional recipe use a preserved vegetable called ‘chuan dung chai - 川冬菜’ but I don’t think this is available in UK, can substitute with Szechuan Zha Chai - 搾菜 or Tianjin preserved vegetable - 天津冬菜 If you find it too salty, soak in water for a while. Mix salt and five spice with the ground roasted peanuts. Cook noodles as per instruction. Mix cooked noodles with sauce. Top with some hot stock if you like the noodles to be wet than dry. Sprinkle on spring onion and spiced ground peanuts.